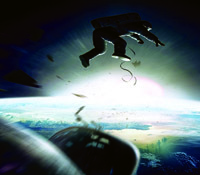 Gravity (Sci-Fi/Thriller),HBO Defined, 10 pm Cast: Sandra Bullock, George Clooney, Ed HarrisDr Ryan Stone (Sandra Bullock) boards space shuttle Explorer for her first space mission. Shea��s joined by veteran astronaut Lieutenant Matt Kowalski (George Clooney) who is on his final expedition. During a spacewalk, Stone is accidentally cut away from the shuttle, but Kowalksi manages to use a manned manoeuvring unit to retrieve her. On their return, they find the third and last crew member dead because of a shower of space debris. Kowalski and Stone must try to find a way to survive in space with depleting oxygen, fix the space shuttle and return to Earth. One of the scenes in the opening montage has an Indian astronaut singing Mera joota hai Japani. Legendary (Drama), HBO Hits, 8 pmA�Cast: Patricia Clarkson, John Cena, Devon GrayeA�Teenager Cal Chetley (Devon Graye) prefers books to sports. But constant bullying leads him to take up wrestlinga��as a means of self defence and to reconnect with his estranged wrestler brother, Mike (John Cena). Mike coaches Cal from his jail cell, but their mother, Sharon (Patricia Clarkson), soon finds out what is happening. While she is initially un-supportive because she was let down by Mike, she slowly comes to terms with the good that is coming out of the two brothers uniting. Director Mel Damski has not made any other film, after Legendary released in 2010. Pain & Gain (Crime / Comedy), HBO, 6.20 pmA�Cast: Mark Wahlberg, Dwayne Johnson, Anthony MackieA�Newly released from prison, Daniel Lugo (Mark Wahlberg) lands work at Sun Gym and does an admirable job of increasing membership numbers. But his work brings him into contact with wealthy gym member Victor Kershaw, whose riches Lugo believes are ill-gotten. Lugo hatches a plan to kidnap Kershaw, teaming up with fellow trainer Adrian Doorbal (Anthony Mackie) and Paul Doyle (Dwayne Johnson), another recently-released convict. But their extortion plan gets complicated when they decide to kill Kershaw. Despite only three weeks of training, Mackie gained 17 pounds of muscle before filming began. The Package (Action),Star Movies, 3.30 pmA�Cast: Steve Austin, Dolph LundgrenA�Tommy Wick (Steve Austin) is tasked with delivering a mysterious parcel to an equally mysterious person, named The German (Dolph Lundgren). The German is a known crime lord and Wick doesna��t quite know what he is getting into. He comes under constant attack while trying to deliver the package. That makes him curious about its content and he heads to his friend Big Doug for help. However, Wick gets captured by a rival gang. He manages to escape only to be captured by The German. Will Wick get out of the sticky situation alive? The film was never made for the big screen and was a direct-to-video release. 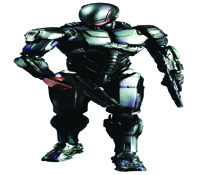 Robocop (Sci-Fi / Action),A�Sony Pix, 12.57 pm Cast: Joel Kinnaman, Gary Oldman, Michael KeatonA�Set in 2028, in Detroit, Alex Murphy (Joel Kinnaman) has the ideal life as a husband, father and cop. But when a criminal seeks revenge, Murphy is left with severe burns. His wife, in order to keep him alive, takes up the offer of Sellars (Michael Keaton) and his company OmniCorp to turn him into a self-thinking robot. Initially outraged by his plight, Murphy slowly learns to cope with his new metal body. While his power is robotic, he still thinks like a human, making him the hero in the city as he strives to control crime. But his good intentions are tested when he realises that Sellars isna��t as good as he seems. Douglas Urbanski, who plays Mayor Durant, is actually a non-actor but has been Oldmana��s manager and partner for several decades. Yaariyan (Drama / Romance), Star Gold, 9 pmA�Cast: Himansh Kohli, Vivek Bhatnagar, Nicole FariaA�This college campus story revolves around the too-cool-for-school kid Laksh (Himansh Kohli), popular girl Jiya (Nicole Faria), geeky Saloni (Rakul Preet Singh) and biker boy Neil. Their laid-back existence comes to an end when their university campus is bought by an Australian business man intent on building a casino. The gang manages to persuade him to lease the land back to the college if they can defeat an Australian quiz team in a five-round competition. While much of the movie is set in Australia, the shooting actually took place in Cape Town. Cuckoo, Comedy Central, Monday to Friday, 10.30 pmA�Season two of Cuckoo, the British sitcom, takes off after the death of Andy Samberg (Cuckoo), a hippy. The latest episode is about a young man, Dale, who claims to be Cuckooa��s son and wants to find out how his father died. In the latest episode of Swamp Wars, the Venom One Team, which protects Florida from snakes and reptiles, catch a 400-pound crocodile in an attempt to save a group of kids playing near the swampy marshlands. After the successful catch, there is another attack by venomous snakes. Will they be able to pull off another victory over the reptiles? Australia Vs South Africa, Star Sports, November 21, 8.30 amA�The fourth one day international between Australia and South Africa is set to take place in Sydney. With the series equally balanced, with one victory each, the pressure will be on South Africaa��s fast bowler Morne Morkel and batsman Dale Steyn to keep them in the running. 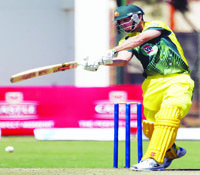 Australia, with in-form batsman Mitchell Marsh and bowler Josh Hazlewood, will look to win the series with their home advantage.